I saw this box of cards by Papyrus awhile ago and fell in love with them -- the blocks of color are so fun. So, I decided to make my own. I mean, why pay $16.95 for six cards when you can make one with $17,000 worth of supplies? Sentiment from an Altenew set that came with a kit. And, since I liked it, I made another with different colors. See, all those supplies come in handy! This would make a cute valentine. Get it? 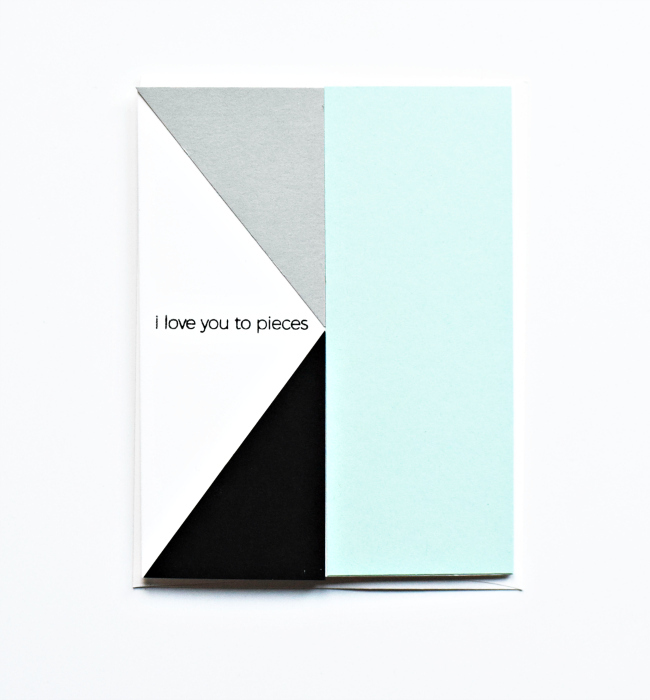 I love you to pieces, as in pieces of cardstock? Sorry... Cute saying from Right at Home's Tiny Sentiments. You ROCK! And make me laugh, too! Holy cow, and only 6 cards in a $16.95 box! I love your idea! Sheesh, think of all the $17,000 scraps you could use up. Move over, Papyrus! how fun and besides using all those supplies all those pieces of scrap paper could be put to use - how thrifty is that!!! Clean & classy girlfriend ... love them. $16.95 for a set of CARDS??? Just look at the money we've saved by making our OWN!!!! At any rate Joan, your "inexpensive card" is beautiful! Thanks for the Sunday morning laugh. Fabulous graphic card with an excellent color combo!